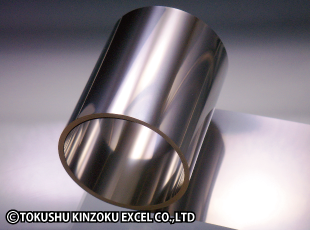 Maraging Steels (MAS-1) | TOKUSHU KINZOKU EXCEL CO.,LTD. Maraging steels were originally developed by US firm INCO. They are ultra-high-strength, age-hardened steels made from low-carbon 18% nickel steel to which Co, Mo, Ti, Al, and other materials are added as age-hardening elements. In addition to providing extremely high strength through age hardening, maraging steels are used in aircraft, rockets, missiles, and satellites and other space exploration equipment due to their excellent toughness and high notch strength. We supply MAS-1, a steel grade manufactured by Daido Steel. MAS-1 is a typical ultra-high-strength steel that provides toughness and is also able to acquire strength of more than 1,960 N/mm2 through age hardening. It is used for watch parts, computer parts, precision springs, diaphragms, and other components requiring an extremely high level of reliability. 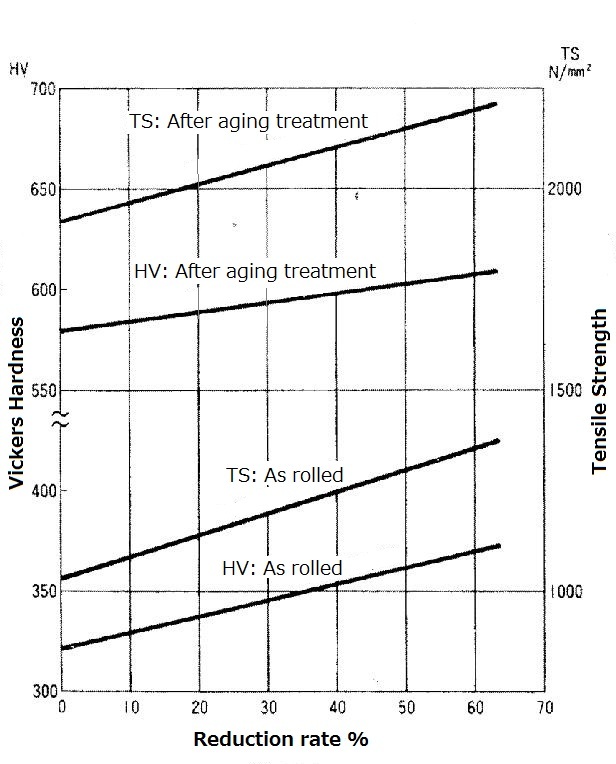 MAS-1 can provide tensile strength of over 1,960 N/mm2 through comparatively simple age-hardening treatment. This strength can be increased through cold working. For example, the tensile strength of cold-rolled MAS-1 with a reduction rate of 50 percent can reach 2,110 N/mm2 after age hardening. In addition to high strength, MAS-1 provides excellent toughness, and also has high notch and fatigue strength. Because MAS-1 does not require rapid cooling after age hardening, handling is easy, and there is very little deformation due to heat treatment. As MAS-1 consists of 30 percent expensive elements such as Ni, Co, and Mo, it is one of the more expensive ferrous alloys. However, these same materials give it comparatively good weldability and machinability. We are the only company that deals with rerolled maraging steel. We can also supply ultra small lots of MAS-1 from orders as small as several tens of kilograms. We can manufacture foil products with a thickness of 0.10 mm and thinner. (1) Solution heat treatment: Metal kept at temperature of 820°–870°C for several minutes and then cooled. As the Ms point is around 150°C, MAS-1 is a low-carbon martensite phase at room temperature and has a Vickers hardness of 300–330 HV. For this reason, despite the fact that MAS-1 provides toughness, it cannot be worked like typical soft materials. 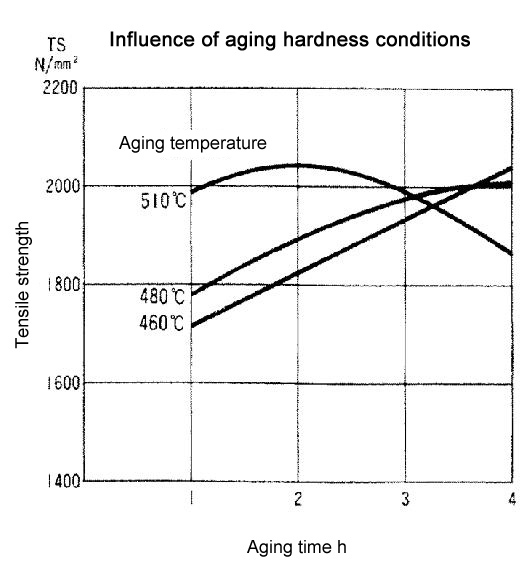 (2) Age hardening: Standard treatment involves keeping metal at temperature of 480°C for 3 hours. Some variation in combination of temperature and time is allowed. Refer to the graph below when making adjustments. (3) Heat treatment atmosphere: Hydrogen or AX gas is appropriate. (4) Corrosion resistance: Because MAS-1 is a high-alloy steel it is often assumed to be rustproof like stainless steels. However, since it does not contain the stainless component chromium, it requires the same rust-preventive measures that would be used for normal steels. Precipitation hardening (heat treated) stainless steels are grades that can provide high strength. We supply SUS631 (17–7PH) and SUS632J1 (15–7PH) grades.